In this Nov. 18, 2016 file photo, Cincinnati coach Tommy Tuberville walks off the field after the team's NCAA college football game against Memphis in Cincinnati. Tuberville is joining the Republican race to win back the Senate seat from Democrat Doug Jones in 2020. 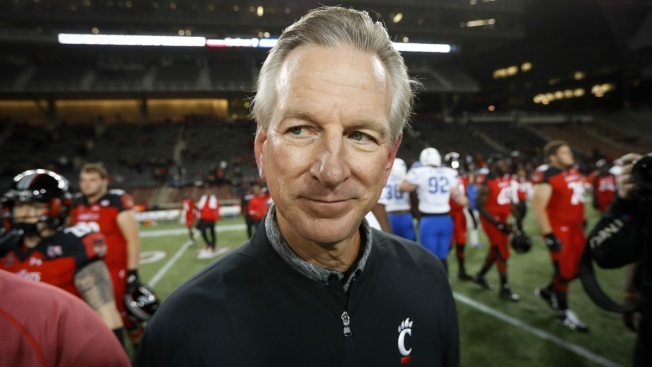 Tuberville is set to announce his candidacy Saturday, April 6, 2019, according to a person familiar with Tuberville’s decision. Former Auburn University football coach Tommy Tuberville is joining the Republican race to win back the Alabama Senate seat from Democrat Doug Jones in 2020. Tuberville announced his candidacy Saturday on Twitter, saying: "After more than a year of listening to Alabama's citizens, I have heard your concerns and hopes for a better tomorrow. I am humbled to announce the next step -- I will be a @GOP candidate for US Senate. I invite you to join my team." Already in the GOP race is Bradley Byrne, a congressman. The primary is set for March 3, 2020. Jones, a former U.S. attorney, defeated ex-state Supreme Court Chief Justice Roy Moore in a special election in 2017 after Moore was accused of sexual misconduct with teenagers. He denied the allegations. Tuberville, a native of Arkansas, kicked around the idea of running for governor of Alabama in 2018, but decided to stay out of politics at that time. He has previously described his life in college football as "being in politics for the last 40 years." In 21 seasons as a head coach, Tuberville won 159 games with Mississippi, Auburn, Texas Tech and Cincinnati. He stepped down at Cincinnati after the Bearcats went 4-8 in 2016.